Yesterday was Older Daughter's 19th birthday! Seems hard to believe that our little Christmas baby is all grown up. But with the ease all young people seem to have with electronics, she soon figured it out. Cooked one of her favorite dinners, chicken piccata and Brussels sprouts. In lieu of cake, she preferred two store-bought chocolate cream pies. Happy birthday! Lovely photos, and your header is stunning. How did the child get to be 19 already??? Time has flown! Seems like she was just a kid only last week! Happy Birthday to your sweet Christmas season baby, who's grown into a beautiful young woman. 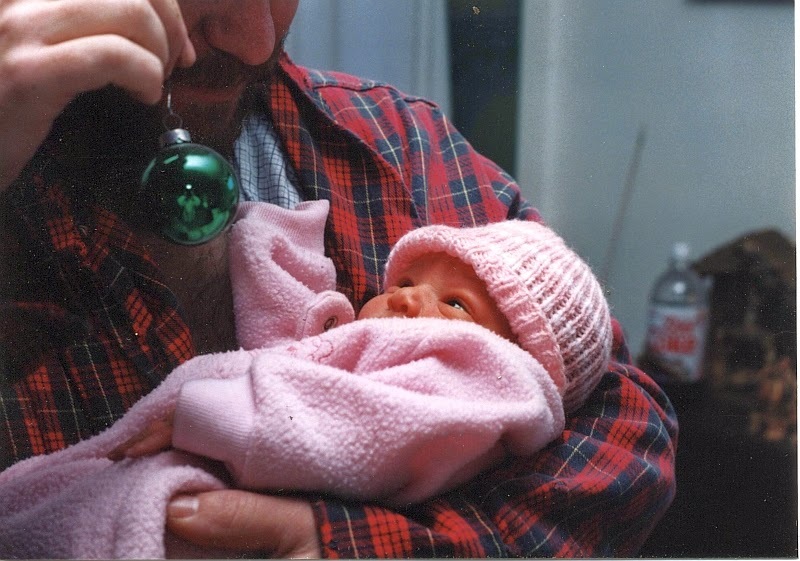 But she'll always be Daddy's little girl, reaching for that pretty, shiny ornament. Happy 19th Birthday To You Daughter! Our kids grow up so darn fast, before you know it she will be out the door. (wince) Condolences on the loss of your mother-in-law. But how wonderful that she was so loved. Love the picture of Daddy holding her in an outfit still too big for her. We just had our son a few weeks ago and I love when their little bodies are still too small for the outfits we waited all those months to put them in. Congrats to your "little" girl!